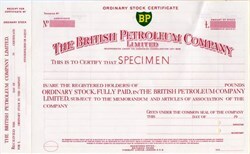 Beautifully engraved RARE Specimen certificate from the British Petroleum Company printed in 1954. This historic document has a vignette of the company's logo. The certificate came of of the archives of the famous printing company‚ Bradbury, Wilkinson & Co., London. Bradbury, Wilkinson & Co. was founded by Henry Bradbury in the middle of the 19th century. BP is one of the world's largest petroleum and petrochemicals groups. Their main activities are exploration and production of crude oil and natural gas; refining, marketing, supply and transportation; and manufacturing and marketing of petrochemicals. They have a growing activity in gas and power and in solar power generation. BP has well-established operations in Europe, North and South America, Australasia and Africa.